We saw it happen three times with Win10 1709. 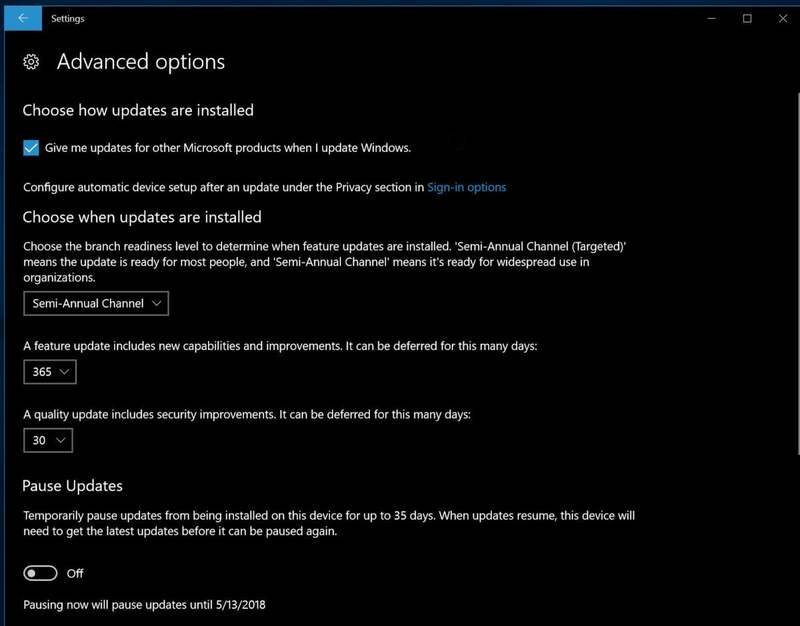 Now we’re getting reports of Win10 1803 being pushed to Pro PCs with “branch readiness” set to Semi-Annual Channel — the setting that’s supposed to specifically keep 1803 away until it’s ready. If this weren’t so infuriating it’d be heartbreaking. According to multiple reports, Microsoft is pushing Windows 10 version 1803 onto PCs that are specifically set to bypass the upgrade until it’s declared fit for business use. Susan Bradley. We saw forced upgrades three times with Win10 version 1709. In mid-November 2017 Microsoft pushed many Win10 1703 customers with “Current Branch for Business” selected onto 1709. In mid-January 2018, the company pushed many Win10 1703 customers onto 1709, even though they had “feature update” deferrals set to 365 days. In early March 2018, Microsoft pushed Win10 1703 customers onto 1709, based on the company’s contention that it has a right to do so if telemetry is turned off (Diagnostic Data level set to zero). In Microsoft’s mixed-up world of update terminology (which has changed at least three times in the past year), “Semi-Annual Channel” – formerly “Current Branch for Business” – is supposed to delay upgrades until Microsoft determines that the new version of Win10 is fit for human consumption, or, presumably, paying business customers. This comes on the heels of the original rollout three weeks ago, when those with the temerity to “Check for updates” were deemed seekers and treated to an upgrade with no option to stop it. It seems “Check” has a different meaning in Win10 update terminology. Those who don’t have branch readiness set to “Semi-Annual Channel” – including all Win10 Home customers, who can’t set branch readiness – are considered cannon fodder, ready for the unpaid beta testing phase whenever Microsoft sees fit. In the past, Microsoft has said that it takes about four months to get their final, best version of Win10 debugged to corporate standards. Now, the length of delay – and the method for notifying folks that the new version has passed muster – is open to debate. The method and delay have changed with each of the Win10 versions (1507, 1511, 1607, 1703, 1709) that we’ve seen. It isn’t clear at this point if those being upgraded to 1803 have set their Diagnostic Data level to zero. We’ll keep you posted as we hear more. Microsoft, of course, isn’t saying a word. Bradley recommends that you use wushowhide to search and destroy the upgrade before it gets installed. Of course, you have to remember to run wushowhide prior to clicking the “Check for updates” button. Every. Single. Time.